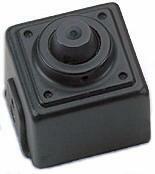 The camera stands out in the subminiature CCTV market. With a verified low LUX rating (.003) the camera can see clearly under extremely low light situations without the aid of infrared illumination. Although under complete darkness the need for infrared illumination can’t be replaced. Remarkably small size (3/4” square) is a perfect match for covert operation. 600 lines resolution gives guarantee for high quality images. The camera comes with Sony’s latest CCD technology known as ExView SuperHad vision. Ships with Mounting bracket, 2 ft. BNC Video and Power cable.